This past weekend I ran a game session for five children. 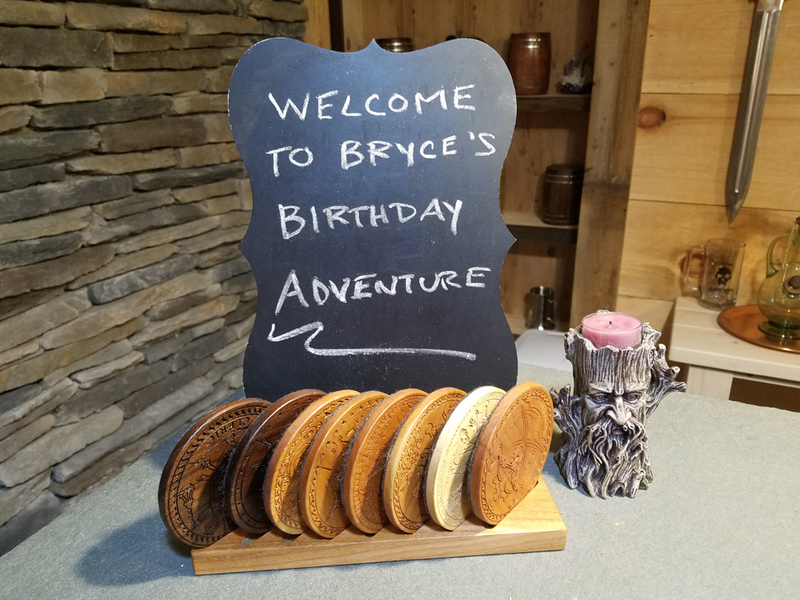 For background it was my son’s tenth birthday and he wanted to invite some friends over from school. The best part was none of these kids had ever played D&D, or any role-playing game for that matter. This was an interesting challenge since the last time I DM’ed a room full of ten year olds was 1983, when I was ten! Admittedly I did not really have much time to prepare since I have been working around the clock. That said, the game lasted around 2.5 hours and the kids had a blast. A few months ago when Bryce initially asked me to do this I started planning the day. Since I knew the children being invited had never played, I wanted them to leave with the game. I combined the 5E Basic PDFs into a book and had them printed on Lulu. For the cover I used the mock-up by TheBlueKnight found here on EnWorld, and added my son’s name and birthday party date in Photoshop. As pictured below the books turned out fantastic and the children all left with a unique party favor. In addition they all received their very own first set of polyhedral dice. 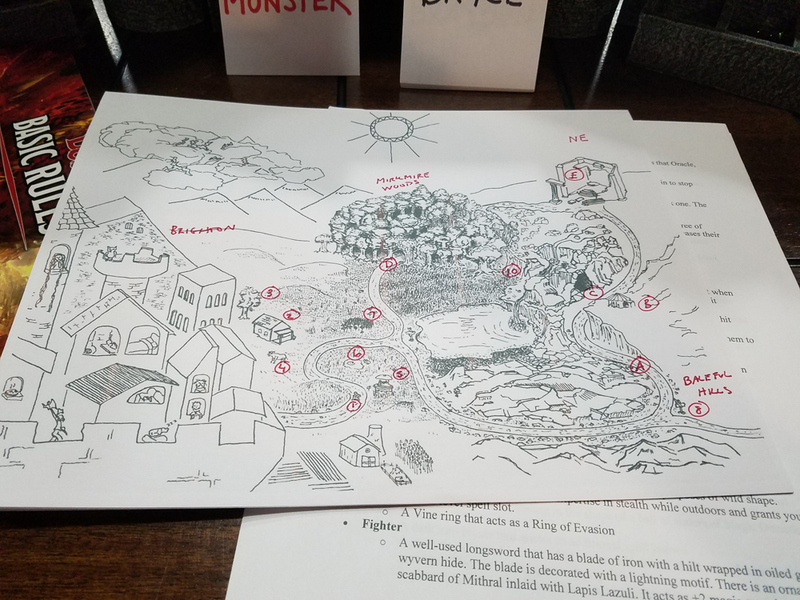 My initial idea was to run a spooky Halloween themed adventure complete with fun props. But time just was not on my side and I was left scrambling the morning of the party. That is when I found On a Children's Quest, A Starter 5e Adventure. What initially attracted me to the adventure was the illustrated map, which seemed perfect for a bunch of novices. 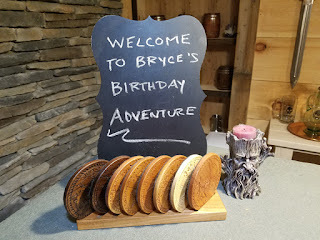 I did not use the adventure completely as presented, but rather as a template to take the kids wherever their imagination wanted. Having actually used this adventure in live play, I will say there is lots of potential here in terms of format with kids. People (especially kids) are very imaginative and visual so having the illustrated map was a win. Each of them was provided with their own copy they could mark-up or add notes with. At the table I used a combination of miniatures, Chessex play mat, Dwarven Forge, and miscellaneous terrain pieces to create the environment. The kids absolutely loved looking at everything and being involved with these tactile elements. Just holding and rolling their new dice alone was fun, especially when someone rolled a coveted 20! The pre-generated characters I used were complete but we almost never referenced the sheets during play. Instead I explained the basic concepts and the kids began picking it up quick. For instance, at one point a strength check was needed to move something. This prompted everyone to look at their character sheets and the kids had fun comparing their attribute scores. I’m a big fan of the KISS acronym ("Keep it simple, stupid") and it paid off big when introducing these kids to the game. My reasoning for giving them completed characters was so they have a template for later. Overall I must say this was equally a fun experience for me as a Dungeon Master. 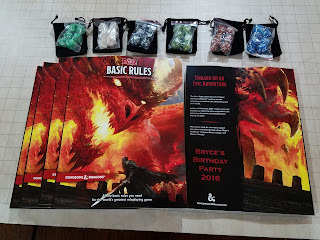 Not only was I sharing this wonderful hobby with new players, but hopefully making some lifelong ones. Although it’s early in the process to see if they caught the D&D bug, there is already talk of starting a club amongst they kids at school. 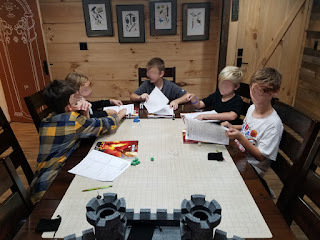 My son has volunteered to be the Dungeon Master which really makes me smile. If anything seeing these children unplugged for a few hours and enjoying a table-top game was worth the price of admission. During our session they expanded their vocabulary (portcullis…what is that! ), did lots of math, and most importantly worked as a team to come up with plans to negotiate the various challenges of the adventure. 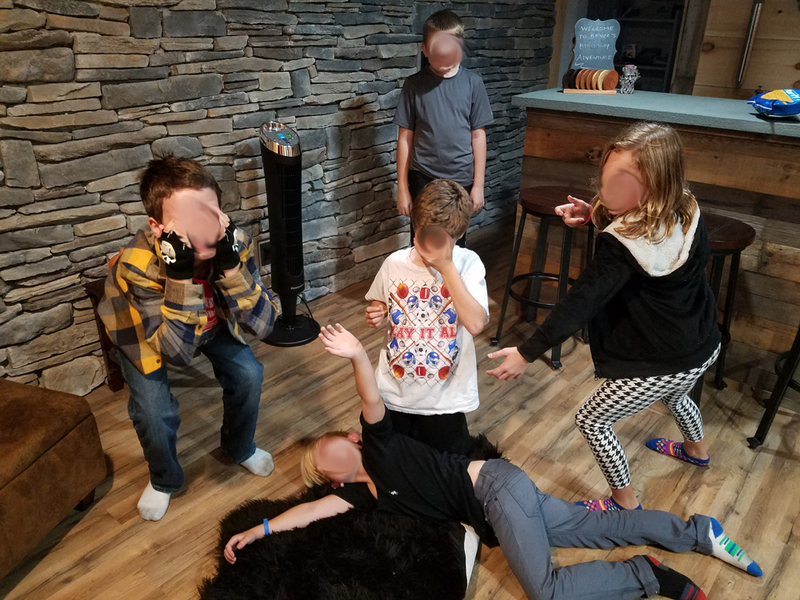 If you are reading this and considering introducing your children to role-playing games I highly recommend it. Not only does it have the aforementioned benefits, but it also lets them exhibit qualities like leadership and critical thinking. Furthermore they are presented with constant hypothetical situations they must work through as a group. My final advice when running a game for kids is keeping it short and simple. The mind can only absorb what the seat can endure and this could not ring truer with kids. My group started to get restless around the one hour mark so we took liberal breaks. Some kids have longer attention spans then others so be aware that a D&D session is not an endurance contest. Also be sure to put the spotlight on every child as some have stronger personalities then others. 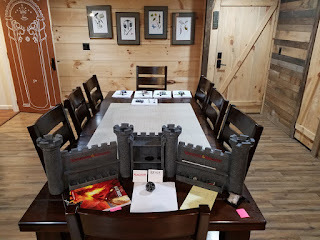 Just like an adult session, it's quite possible for one player to run the table if the DM does not stay on their toes. We finished our session with a sundae bar and talked about the game. I asked the kids what they liked the most and least about the experience. Universally they enjoyed exploring and finding treasure, and did not like that the adventure was over. Finally I asked them all if they would like to play again to which I received a resounding YES! The kid's reenactment of a failed Death Save. So to all the veteran players and DMs out there take some time to share the hobby with the next generation. They will be as wide-eyed and interested as you were when first discovering role-playing games….they just don’t know it yet!